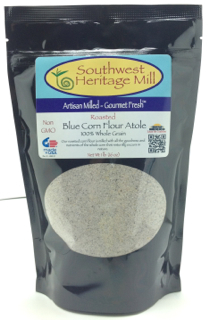 Atole – Roasted Blue Corn Flour – Fine Grind, 100% Whole Grain, Non-GMO. A fine grind flour that has been roasted to perfection that enhances any recipe. The roasting enhances the flavor and increases the shelf life without affecting the nutritinal value. Use in place of a regular cornmeal or flour.